We got up early (2am) on Friday morning to get the best of the tide for our passage around the western island (Basse Terre) of Guadeloupe. There was little wind in the lee of the island. At the southern tip it was gusting off the hills. We also encountered quite a few other sailing boats coming and going from the Iles des Saintes as well fishermen checking their lobster pots. With the wind and seas coming from the direction we were heading we motor-sailed until we were able to lay a course for our destination, Pointe-a-Pitre. 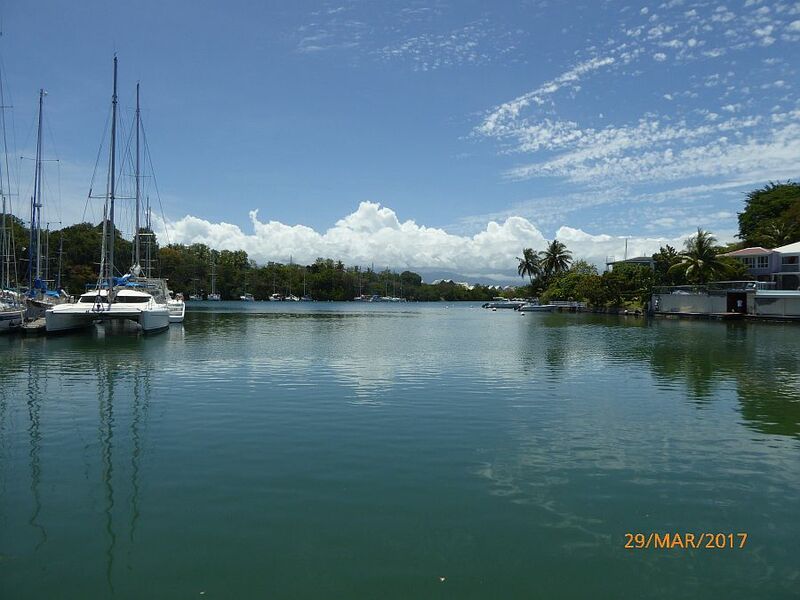 The marina at Pointe-a-Pitre, the capital of Guadeloupe, is large and well-sheltered, with an outer and inner lagoon. One of their staff guided us into the inner lagoon where we will leave Lynn Rival for a trip back to Europe.